Barry, John (1745-1803), American naval officer, noted for his achievements as a commander in the United States Navy during the American Revolution. He was born in Ireland. He went to America about 1760 and, settling in Philadelphia, acquired wealth as master of a merchant vessel. In 1776, during the American Revolution, he was appointed to command the brig Lexington and subsequently captured the British tender Edward, the first ship ever taken by a commissioned officer of the U.S. Navy. Two years later he became commander of the Raleigh, which was soon afterward pursued and driven ashore by a British man-of-war. In 1781, while in command of another ship, the Alliance, he captured the British ships Trepassy and Atlanta. Barry’s outstanding record during the American Revolution earned him prestige and he was named senior captain, the highest post in the Navy at the time, and was accorded the courtesy title of commodore. After helping supervise the reorganization of the U.S. Navy in 1794, Barry was made commodre of one of the Navy’s new flagships, the United States. 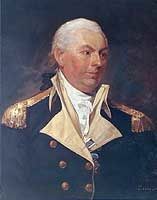 From 1798 to 1801 he directed American naval operations in the West Indies.